The Michigan State Spartans ended 2010 (and started Big Ten conference play) with a win over the Minnesota Golden Gophers today. Despite a miserable first half of shooting, the Spartans (currently ranked #19) fought back in the second half to pull away from the #13 Gophers at home. This was a great start to the Big Ten conference schedule for the Spartans who have struggled in their brutally challenging non-conference schedule (the Spartans suffered losses to four ranked opponents, three of which were on the road). It is now time to settle in and focus on the Big Ten schedule (which will be no cake walk either) as we continue down the road to the Final Four and March Madness in the Spring. Go Green! On an evening of celebration, as we ring in the new year, if you are planning to go out and consume any alcoholic beverages, please be sensible and give yourself (or your loved ones) a hogmanay of either a designated driver, or a taxi ride home, or an overnight stay in a hotel. 1. A gift given on New Year’s Eve. 1. New Year’s Eve in Scotland. I’m sure you’ve all heard this adage about no pain and no gain. During the course of my running (or other athletic endeavors), I have repeated this adage and have even pushed myself to the point of discomfort (I would not have called it pain — except for those occasional times when I was actually injured from over-training). Then there’s a phrase I remember from the movie “Roadhouse” (Patrick Swayze), “pain don’t hurt,” that has always intrigued me. Do some people merely have a higher tolerance for pain? I’m convinced they do. Yet another wonderful quotation about pain that I have always liked is “pain is weakness leaving the body” (courtesy of the U.S. Marines). Most people consider pain a bad thing and attempt to avoid it at all costs (amen), however, were you aware that there have been studies that show a connection between physical pain and positive emotion? There are some people (masochistic types perhaps?) who actually enjoy pain (and/or punishment) and the positive effect it has on their emotions. Is it really the pain that they enjoy? Or rather, the relief experienced by the removal of intense pain? An interesting concept indeed. Have you joined the social media craze yet? Are you an active Facebook or Twitter user? Have you seen the latest demographic breakdown of these social media. If you haven’t, fear not, here’s an infographic that does just that (courtesy of www.digitalsurgeons.com). Are you looking for a new holiday dessert? Are you needing to use up some leftover eggnog? (Leftover? Eggnog?) Well, how about an eggnog cake (with bourbon cream frosting)? I ran across this recipe in the blogosphere (courtesy of Jennifer Sinclair and her “Life in the Garden” blog) and can’t wait to try it out; it sounds absolutely wonderful (a simple recipe for eggnog [a non-alcoholic version] is included). Of course, you can always use commercial eggnog from the store; but if you’d like to try your hand at concocting your own, here are some other recipes to get you started. I would have loved to have found this recipe earlier in this holiday season. I may just have to try this out in the next week or so . . . just because. Of course, I never seem to have any leftover eggnog. A cheesecake (I’m thinking a gingersnap crust) would be another alternative for using up the eggnog . . . hmm, the delicious possibilities. Apparently there is more than one kind of fog. I had no idea. Fog generally forms when a moist air mass is cooled to its saturation point (dew point). There’s radiation fog (the result of radiative processes), advection fog (advection of warm air over cold surfaces), precipitation or frontal fog (the evaporation of precipitation), upslope fog (air being adiabatically cooled while being forced up a mountain), valley fog (air being radiatively cooled, during the evening, on the slopes of topographical features), sea fog (advection fog over a body of water), and ice fog (fog that is composed of suspended particles of ice) [to name a few]. Some valley fogs are extremely thick (more that 1500 feet) and can last for days. But did you know that there was another name for a certain type of valley/ice fog? Sure enough . . . beware the pogonip! 1. An ice fog that forms in the mountain valleys of the western U.S.
What a wonderful surprise to open a package from my niece and find this beautiful limited edition print. Then to discover upon closer examination that my niece was the artist . . . wow! Allow me to offer a huge shoutout to Elizabeth Rink, thank you! And, it is just the right size to fit into one of the available blank spaces on my apartment walls (which are very few and far between indeed). 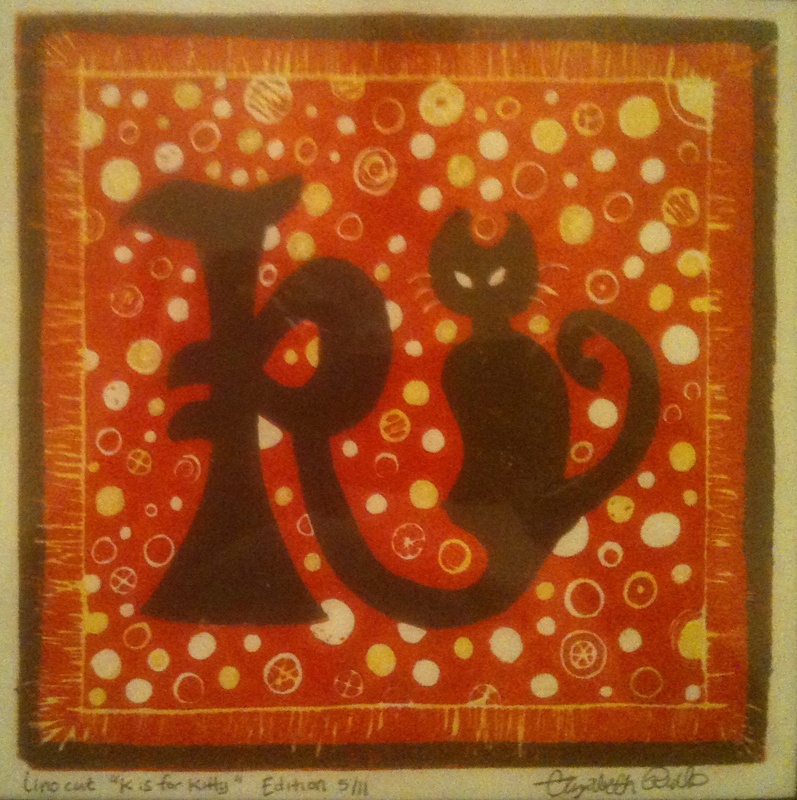 The artist: Elizabeth Rink; the medium: lino cut print; the edition: #5/11; signed by the artist. One of the Christmas cards that I received this year used the following poem. It is a simple, yet powerful poem; and, in addition to my eyes and my ears, I would hope to have my heart attuned as well. Merry Christmas one and all. of hope and faith and love. On this Christmas Eve, I’ve decided to post one of my all-time favorite contemporary Christmas songs . . . it gets me everytime! As we get closer and closer to Christmas Day, allow me to share a few quotations that seem to embody the spirit of Christmas.